11 MERCATOR, G. / HONDIUS, J. Guineae Nova Descriptio. Amsterdam, 1628. Beau col. d'�poque. Bel exemplaire. - A good and strong impression. Paper slightly age-toned. Altogether in very good condition. Wide margins. In attractive strong original colours. 346 x 495 mm. � La carte figure la c�te ouest-africaine depuis le S�n�gal jusqu�au Cap Lopez dans le golfe de Guin�e. L��le de St. Thomae (Sao Tom�), aujourd'hui portugaise, est repr�sent�e en d�tails dans un cartouche en bas � gauche. The map shows the West African coast from Senegal (the 'Rio Senega' is the Senegal River) to Cape Lopez on the Gulf of Guinea just below the equator. 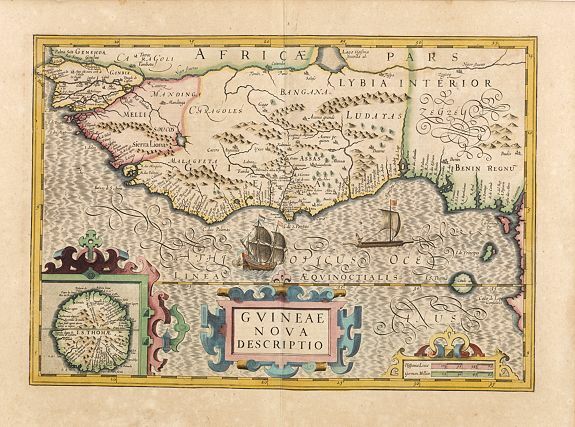 The island of St. Thomae, which today forms a Portuguese province, is shown in detail in the small inset bottom left. Part of Libya is also depicted. The ocean is rendered in the typical moir� style of Mercator, and the several strapwork designs are simple yet imposing. Mercator's sons and grandsons, were all cartographers and made their contributions in various ways to his atlas. Rumold, in particular, was responsible for the complete edition in 1595. The map plates were bought in 1604 by Jodocus Hondius who, with his sons, Jodocus II and Henricus, published enlarged editions which dominated the map market for the following twenty to thirty years. - Norwich, Maps of Africa, number 316.